I’ve avoided the dentist for years. I’m starting to have some problems, like bleeding gums. I know I need to find a way to get back and get the care I need. I’ve had many bad experiences so this has been hard to think about. I’ve done some research and I keep reading that dental sedation is good for someone in my position. I think that is the route I’m going to go. However, there seem to be several different types. How do I know which one is the right one for me to use? Are there many differences between them or do they all pretty much do the same thing? Dental sedation is designed to give you peace of mind. I love when I hear stories of patients being brave the way you are. I know, especially considering your bad experiences, that this is hard for you. You should know I admire what you’re doing. It is also important. Your bleeding gums are a sign you have gum disease. Without treatment, your gum disease will increase leading to you losing teeth. It is much easier to treat gum disease than it is to replace lost teeth. You’ve picked a great solution for your dental anxiety. Patients who’ve used dental sedation have found it has changed their life, enabling them to finally get the dental care they’ve needed for years. Dr. Potts offers two levels of sedation dental care. Which one you get will be determined by your level of anxiety and the type of work needed. The first level avaiable is for patients with mild dental anxiety. It is most often used for paitents who just need to relax them before getting a local anesthetic. Nitrous oxide is sometimes dubbed laughing gas. You breathe it in through a simple nose piece. You’ll feel a tad light headed and relaxed. Then, when your procedure is completed, the dentist simply changes the gas mixture back to oxygen and you are completely back to normal in just a few moments. The biggest benefit to nitrous (aside from relaxing you) is you are able to get on with your day without interruption. You can even drive yourself straight back to work if that’s what you prefer. This type of sedation is very strong. You could compare it to I.V. sedation, but you don’t need a needle to administer it. Instead, you’ll take a simple pill before your appointment. However, OCS is so strong that you won’t be able to drive yourself to and from your appointment. Though conscious, you will feel so completely relaxed that you won’t really care that much about what’s going on around you. Most patients sleep through these appointments. You’ll be loopy and a bit unsteady on your feet. Because of that, you’ll want someone to stay with you after your appointment for a few hours until you are lucid again and able to safely get around on your own. 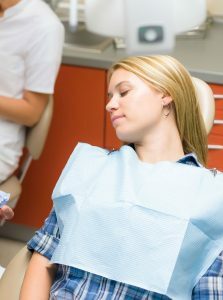 A side benefit to this type of sedation is you can get much more work done in each sitting, allowing you to catch up on needed dental care much sooner than would otherwise be possible. Best of luck to you and I’m glad you’re moving forward with your healthcare.